The Elegoo kit can be upgraded by using a Raspberry Pi 3 for more processing power. The Raspberry Pi is not a microcontroller or microprocessor like the Arduino. Instead, the Raspberry Pi is referred to as a single board computer. This includes a System On a Chip integrated circuit including a multi-core processor, GPU, ROM, and I/O peripherals. The Raspberry Pi is essentially a computer. It runs a modified version of the Linux operating system and includes a graphics driver for HDMI output. The Raspberry Pi comes with its own memory and uses an SD card for storage. This allows users to easily swap between different versions of the operating system or software installed across multiple SD cards. Since the Raspberry Pi is constantly writing to the SD card, it is recommended to get a durable SD card such as the SanDisk Ultra 32GB microSDHC. This will reduce the likely-hood of the SD card becoming corrupted and potentially losing the files stored on the card. Additionally, we will integrate the Raspberry Pi Camera Module V2 to provide an additional sensor to the vehicle kit. While the sonar system is helpful for detecting obstacles, it is not sufficient for complex autonomous navigation. The line following modules only apply to very specific environments and scenarios. Therefore, the addition of the camera greatly expands the capabilities of the vehicle, allowing it to more accurately sense the environment, identify objects, and plan a safe route through that environment to reach a goal. RaspberryPi Learning Resources has a good tutorial that covers the installation, configuration, and testing of the RaspberriPi Camera Module. While the Raspberry Pi is typically powered by the wall adapter during testing purposes, it will need a portable power supply that can power the Raspberry Pi while it is attached to the vehicle and maneuvering through the environment. Most portable USB power supplies will work. The key is to ensure that they have a USB output which is rated for 5V and ideally 2100mA. The current is especially important since the Raspberry Pi will provide power to peripherals such as the camera and WiFi adapter. I have used the Solar Powerbank MP-S6000 which has proven sufficient so far. Additional options are described in this article. Lastly, to operate the Raspberry Pi remotely, it is helpful to have the Raspberry Pi connected to the internet. The Raspberry Pi 3 comes with 802.11n WiFi and Bluetooth 4.1 built in. This allows you to remotely connect to the Raspberry Pi via SSH to execute commands and view diagnostic information about the programs run on the Raspberry Pi. Additionally, data such as images from the camera can be transmitted over WiFi to a more powerful offboard computer. This computer can be used to run more advanced algorithms and software, computer motor control commands, and send those directly to the Raspberry Pi for further transmission to the Arduino. The Raspberry Pi runs off an operating system based on Linux called Raspbian. For this project, the most recent Raspbian Jessie Lite image was installed. The Raspberry Pi website has installation instructions but basically you just download the image and use a program to copy that image onto your SD card. Once the operating system image is copied onto the SD card, you should be able to insert the SD card into the Raspberry Pi, power it on, and get to the initial desktop which looks like the image below. For this project, we will rely on the Robot Operating System as the meta-operating system for the autonomous car. ROS provides libraries and tools to help software developers create robot applications. It provides hardware abstraction, device drivers, libraries, visualizers, message-passing, package management, and more. Along with ROS, Gazebo is used for simulation. A well-designed simulator makes it possible to rapidly test algorithms, design robots, and perform regression testing using realistic scenarios. Gazebo offers the ability to accurately and efficiently simulate populations of robots in complex indoor and outdoor environments. Installing ROS on a Raspberry Pi requires that you download and build ROS from the source code. We will be following the ROSberryPi installation guide and making a few modifications with some patches. First, it is necessary to increase your swap file size to at least 1GB (1024MB) since some of the compiling requires a lot of memory and will crash the Raspberry Pi if you don’t increase the available memory. Start by opening the dphys-swapfile file. Configure your Ubuntu repositories to allow “restricted,” “universe,” and “multiverse.” You can follow the Ubuntu guide for instructions on doing this. 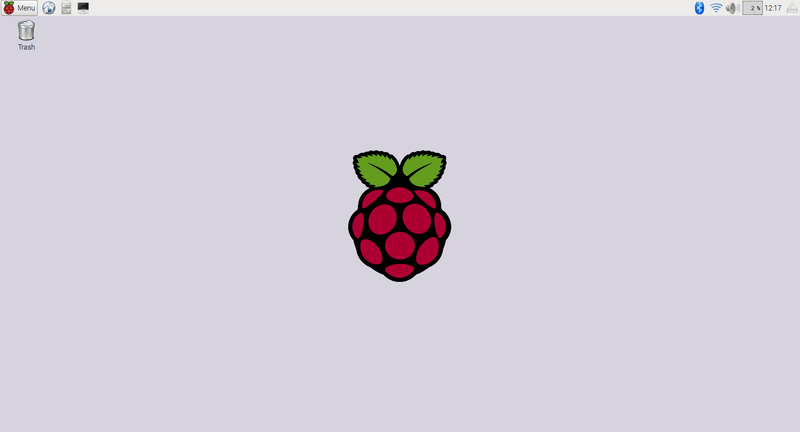 Next, follow the ROSberryPi installation guide instructions for Raspbian Jessie. Note that there are a couple of variants that can be installed. Since we don’t need visualization tools like RVIZ and Gazebo, we can use the robot variant. This variant is defined to be core, stable, ROS libraries for any robot hardware. It is the “general robotics” libraries of ROS. We will add additional packages not included in the variant later. Also note that the collada-dom-dev package must be installed from source since it is not available in the repositories. This requires patching the collada_urfd.cpp file with the patch described in these instructions. You may also get errors compiling RVIZ related to “undefined reference to ‘vtable for Assimp::IOSystem’ “If so, you will need to patch mesh_loader.cpp as described on this tutorial. If you want to add more core packages to the installed ROS workspace, first create a new rosinstall file including the new packages. Update the workspace with wstool and run rosdep to install any new dependencies. Then you can build the system. The commands are below, just update with your deisred package or series of package names. For our autonomous car packages, we will create a new catkin workspace and overlay it onto the existing system for development and testing. The new packages will still have access to all of the core packages, but we will build and compile them separately. This page contains more information on overlaying workspaces. An Xbox 360 controller can be used in place of the typical remote control. This allows users to manually input commands to the simulated system. This page provides instructions on setting up the Xbox controller on Ubuntu 14.04. The jstest-gtk package is a simple program to verify the Xbox controller is installed and functioning correctly. The ROS wiki also contains a tutorial for configuring a joystick on Linux. Note that it may be necessary to update the joy node package parameters in the launch file based on the joystick’s assigned input value. The screenshot below shows a sample output of the jstest-gtk package depicting the measured controller values. The Arduino IDE is handy to have installed on the Raspberry Pi in order to update the Arduino software. This makes it easy to edit the Arduino sketches and update the Arduino board without needing a separate computer with the Arduino IDE installed. The SSH protocol allows you to connect to your Raspberry Pi from a Linux computer, Mac, or another Raspberry Pi. The SSH software is already installed in the Raspbian distribution, but SSH needs to be enabled. 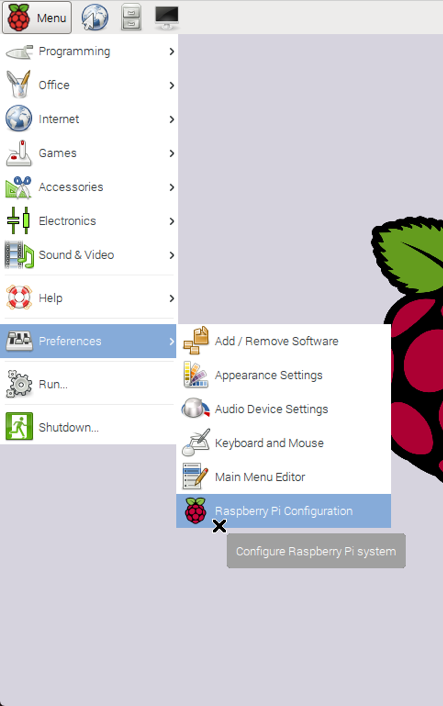 First, go to the Raspberry Pi Configuration tool under the “Preferences” section of the Main Menu. Under the “Interfaces” tab, check that SSH is enabled. Next, determine the IP address of the Raspberry Pi. Once the IP address is known, from a remote computer, run the following command. If you receive a “connection timed out” error check that you entered the IP address correctly. When the connection works you will see a security/authenticity warning. Type yes to continue. You will only see this warning the first time you connect. Once connected, you will be asked for the password associated with the pi username. 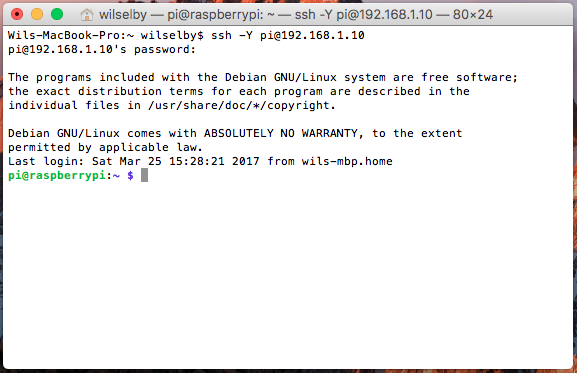 On Raspbian the default password is raspberry. If successfully logged in, your prompt should now be the same as the prompt on the Raspberry Pi. SSH is useful for running commands from the command line but for this project, it’s helpful to have the RaspberryPi user interface. This makes it possible to use the visualization tools in ROS remotely. This page is a good guide for getting this set-up on a Mac computer. 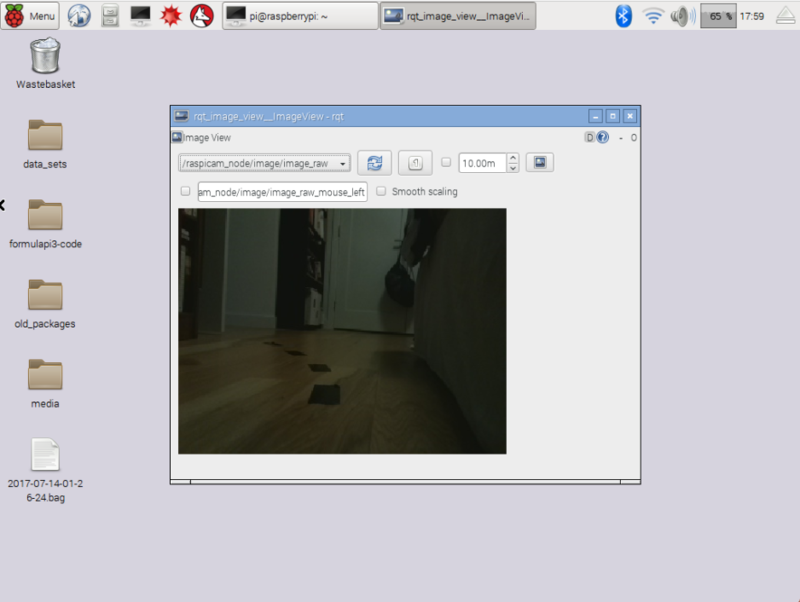 The screenshot below is an example of viewing the camera output remotely in real-time. Depending on the default Raspbian log settings and the size of the SD card being used, it is possible that the SD card could quickly become completely full from large log files. 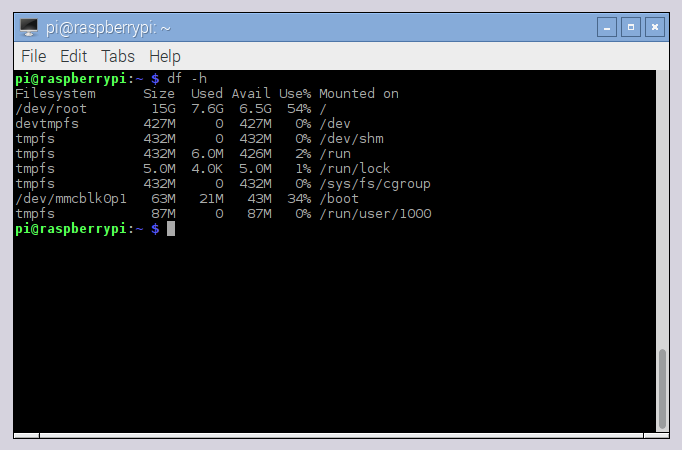 If the amount of disk space remaining looks unusually small, check the size of your logs files. This will arrange the files by size order. These files are the ones that are the largest. Typically, the operating system rotates these logs to prevent them from getting too large. However, it is possible that due to the small storage capacity of the SD card, these files may need to be archived more frequently. Instead, we can tell the system to archive these files once they reach a specific size. Edit /etc/logrotate.conf so that the maximum file size is 250 MB and only 2 copies are maintained at once.